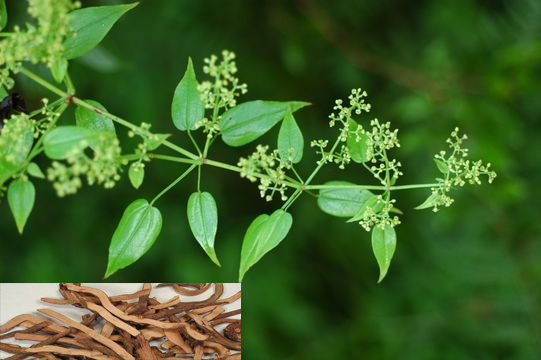 Common Name: Madder root, Rubia root, India madder root. Part Used & Method for Pharmaceutical Preparations: The roots are dug in spring or autumn, and cleaned and dried in the sun. Functions: 1. To cool blood and stop bleeding; 2. To invigorate blood circulation and release stagnation. 1. Hemorrhages due to extravasation of blood by heat. Rubia root (Qiancao) is used with Japanese thistle (Daji), Small thistle (Xiaoji) and Biota tops (Cebaiye). 2. Amenorrhea caused by blood stagnation. Rubia root (Qiancao) is used with Chinese angelica root (Danggui), Chuanxiong rhizome (Chuanxiong) and Cyperus tuber (Xiangfu). 3. Wind-damp obstruction syndrome (painful joints). Rubia root (Qiancao) is used with Spatholobus stem (Jixueteng) and Futokadsura stem (Haifengteng). 4. Blood stasis and pain caused by external injuries. Rubia root (Qiancao) is used with Safflower (Honghua), Chinese angelica root (Danggui) and Red peony (Chishao).